If you’re anything like me then you know one of the best ways to experience a new place is through hiking and over the last four years I’ve had the good fortune of exploring some of the best hikes in Asia. I’ve seen amazing sunrises from breathless mountaintops and islands, hiked to a blue fire volcano and so much more but, I certainly haven’t been on all the trails that this Asia has to offer. So when I started writing the Best Hikes of Asia I realized I would need some help if I wanted to truly show my readers, aka, YOU, the best. I asked dozens of bloggers if they wanted to contribute and the responses were overwhelming. Each of these hikes was hand-picked by a travel blogger who responded to my prompt “Make me want to go on that hike!” They sent me a photo and a few hundred words about the hikes for me to compile into this list. These hikes are all sorted by country to help you plan your next outdoor adventure so feel free to scroll down until you see the country you’re visiting. Now, without further adieu, I hope you enjoy these 40 best hikes in Asia! The Himalayas are famous for their treks and the Annapurna Circuit is one of the best in the world, let alone Nepal. It’s the second most popular trail in Nepal and my personal favorite Himalayan adventure! The 2+ week trek follows a glacial river taking you from Besisahar at 2500 m (8200′) up past Manang and over Thorong La at 5,416m (17,769′) before you come back down and follow another river valley weaving in and out of magnificent glacier-filled mountains. In the foothills the trails wind past waterfall filled foothills that lead up to snowcapped landscapes where you’ll run into a few yak. You’ll enjoy dal bhat (rice & lentils) while staying in local villages and traversing the tallest mountains on Earth! You’re sure other fluffy livestock and maybe even a rare Gharal (blue sheep) or even a snow leopard. But regardless of the wildlife on this you’re sure to enjoy the most beautiful landscapes you can imagine. Many backpackers hike along the trails without a local guide but for as little as $30/day you can hire a local to show you the best viewpoints and find guest houses for you to stay in like I did. Some trekkers lengthen or shorten the excursion by jumping in a bus or jeep between some of the lower towns or take a few side hikes like Tilicho Lake (#2). Crossing Thorong La can be quite challenging especially if blizzard blows through like it did for us in Manang. I highly recommend travel insurance and hiring a guide with you wherever you trek in Nepal. To do the same trek I did ask for Thakur from Nepak Hiking Trek Pvt.ltd. Reserve a room at Dom Himalaya in Kathmandu. My brother and I loved it and it’s perfect for any couple or friends traveling together. Big comfy bed, great internet, delicious buffet breakfast and good water pressure with hot water in the bathroom. Tilicho Lake is one of those serene places in the world still untouched by the mass tourism industry. You can do Annapurna Circuit and Tilicho Lake as one longer trek without a guide. Some tourism agencies estimate Tilicho trek as difficult, some as above average. I’ve done full Annapurna Circuit and I found Tilicho lake the most challenging part. The climb to the lake from the base camp is quite long and steep, though the scenery that opens afterward is breathtaking. Every now and then the adrenaline will pump through your veins when you hear snow cracking high in the mountains. I recommend doing several small acclimatizations walks before trekking to the lake (e.g. taking the upper routes in AC, doing the Ice lake trek – 4620m). You will have to gain almost 800 meters of altitude from the base camp to Tilicho Lake(4920m) in one day. The proper acclimatization will help you lower the risk or even avoid the altitude sickness. Tilicho lake is a three-day side trek (as a rule, from Manang), whether you come back on the Thorong-la Pass route or cross Mesokanto La pass to Jomsom. The last option will require hiring a guide for safety reasons and camping 1 day in the tent. It takes 6-8 days together with acclimatization to reach Manang. Tilicho Lake trek is one of my most memorable experiences and I highly recommend it. Last year I got to spend 5 awesome days trekking in the footsteps of the Annapurna range, in Nepal. Getting to experience the relatively new Mohare Hill trek, also known as Mohare Danda Community Eco-Lodge Trek, was one of the most rewarding experiences of my life to date and a perfect Nepal trek for beginners. It started with days when we would only go upstairs for hours gaining over 1000m of elevation. Leeches popped out as rains started and a stoic menu I wasn’t used to were a few tiny hardships to get through. Thankfully I had a great team (huge shout out to the guys at Royal Mountain Nepal!) and doing was surrounded by one of the most stunning backdrops on Earth to make me realize how lucky I was to enjoy this hike. Anyone trekking the Mohare Danda trek from Galeshwor to Tiplyang will have great chances of witnessing high mountains such as Annapurna 1, Dhaulagiri, Machhapuchre, Annapurna South, Nilgiri and Tukuche Peak. Be sure to stay at Lake View Resort if you are in Pokhara or Hotel Traditional Comfort in Kathmandu! All of these other Nepali treks are high up in the Himalayas but my favorite trails in this trekker’s paradise of a country are actually in the jungle filled lowlands of the Terai. 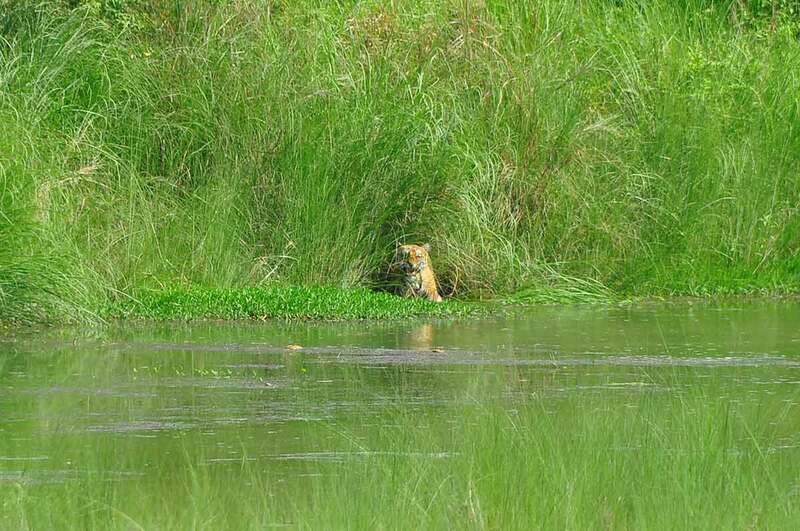 Bardia National Park sits in Nepal’s remote western region and is teeming with wildlife. It’s decidedly the best place in the world to see wild tigers and you’ll find a whole lot more than that! Local guides will lead you into the jungle on foot, jeep, or raft and you’re sure to see an assortment of wildlife. Elephants and rhinos frequent the Karnali and Babai rivers for their lush greenery and refreshing water but you’ll also find monkeys, birds, deer and more. Most people who come to Bardia head out on day trips into the jungle but adventurers can head out on multi-day excursions by foot, jeep or raft. Hiking to Everest Base Camp is a once in a lifetime experience. It is also highly achievable and does not need to break the bank. This is a comprehensive guide to planning an EBC hike including route and trekking options, a packing list, and a detailed day to day guide of each day of the trek. The trailhead starts in Lukla, home of the most dangerous airport in the world with high flight cancellation rates due to weather. Most start their trek as soon as they get off the plane and it is hard to miss the trailhead since most people arriving in Lukla are headed that way. Watch this video of Jesse & Quan’s Everest Base Camp Trek! The trail is lined with tea houses for eating and sleeping, prayer wheels for turning, and a menagerie of animal and people heading up and down the well traveled trail. The sights and sounds are surreal with long rope bridges extending over lush green valleys and rivers, mountain peaks rising high to the sky, and a cacophony of helicopters and hikers along the trail. The real beauty of the hike are those moments when you find yourself alone on the trail with the Himalayan landscape all around you. As much as it was a thrill reach base camp, it was those quiet moments of solitude that remain in your memory long after the hike. Most people head to Nepal for the treks around Everest or around the amazing Annapurnas. However, Nepal has so many wonderful treks that are overlooked by tourists. This is the case of the Langtang – Gosaikunda trek, a hike that can easily be done in 10 days with a climb on the Tsergo Ri peak too. It is not too difficult of a trek and I would describe it as a moderately with just a few tougher spots. But, given that there are not as many tourists as in the other areas, you are sure to find this one of the quieter trails in Nepal. In order to start the trek, you need to get to Syabrubesi, a 7 or 8 hour bus ride or 6 jeep ride from Kathmandu. From there you will start your way in the amazing Langtang National Park. The main highlight of the area is Kyanjing Gompa village and from here I suggest taking a side trip to climb Tsergo Ri (4984m). The views from Tsergo Ri are simply breathtaking. Gosaikunda is home to a holy lake where locals go in pilgrimages and you will end the trek in Dunche before catching a bus back to Kathmandu. If you want a trek with incredible views and fewer tourists, do try the Langtang – Gosaikunda trek! Wanderthirst Hostel – A beautiful new, budget hostel for travelers. Great rooftop view, relaxing atmosphere, good food and good people. Healthy breakfast! Dom Himalaya – Perfect for a couple or friends sharing a room. My brother & I stayed here for 2 nights and it was the best place I stayed in Nepal. Big comfy bed, great internet, delicious buffet breakfast and good water pressure with hot water in the bathroom. Mostly everyone comes to Indonesia to go island hopping in flipflops but one of the best adventures in this amazing country is to hike it’s incredible volcanos and my favorite is Mount Rinjani. Climbing Mount Rinjani in Lombok is not an easy thing to do I would give it an 8 out of 10 for difficulty. I am pretty fit but the hike to the summit in the middle of the night is pretty hard. The most popular way to hike Rinjani is a 3d/2n tour that lets you camp twice on the rim of the amazing crater lake. Hiking in this incredible landscape will make you wonder if you’ve left Earth behind for some new magical land. The green mountains, the blue crater lake, the active volcano in this incredible valley offer views all the way across to the ocean make it hard to believe you’re in the beachy paradise called Indonesia. This incredible trekking can only be done if accompanied by a licensed guide and a porter, who can easily be found everywhere in Senaru in Lombok. After the trekking I recommend you to stay in Rinjani Lodge on the slopes of the mountain. With two infinity pools overlooking the valley this is the perfect place to rejuvenate after 3 intense days in the mountains. The sea of clouds resting up against Cemoro Lawang was the reason I visited Mount Bromo. I saw a dazzling sunrise photo in some travel magazine years ago and vowed that I would one day hike Mount Bromo. Even better was that I actually got to do two different hikes here and if I’d planned it better would have spent a few extra days to keep trekking around this magnificent region. Reserve a homestay in Cemoro Lawang and start planning your Mount Bromo hike! Located in the middle of Java, Indonesia the Tengerr Caldera is home to three volcanoes, the most famous of which is Mount Bromo. Bromo is constantly erupting and you get a gorgeous sunrise view from the edge of the caldera. Alternatively you can cross the sand sea and hike up to the rim of Bromo itself. The gases here aren’t as strong as at Mount Ijen but a shift in the wind will leave you coughing so I recommend renting a mask here too. If you only have time for one hike I recommend the sunrise hike which will take you about 2 hours. If you’re feeling lazy you can always hire a local motorbike or jeep to take you to the viewpoint but be warned that you’ll be fighting loads of tourists up there. Plus the view is just as good from a little further down. However you decide to hike Mount Bromo you are sure to have a great time! The blue fires of Mount Ijen are quite possibly the most amazing natural sight I’ve ever seen. Walking up the rim of a volcano at midnight with a blue glow slowly growing in the distance is truly surreal. The blue fire comes from the sulfuric gases and a magical turquoise lake fills the crater of Mount Ijen making it a beautiful landscape during the day too. Bring a picnic to enjoy the sunrise over the sea and you’ll find that you never want to leave Mount Ijen. Along the way you’ll pass miners who spend their lives carving sulfur out of the blue flames. If you visit be sure to bring some change to give them and they’ll gladly pause and chat with you for a few moments or smile for a photo. Book a room at the Kawah Ijen Inn and get ready for your blue fire volcano hike! The hike isn’t too difficult but has a fair amount of elevation gain and should be done at night to see the blue fire. Be sure to rent a gas mask if you plan on going near the fire, they are cheap to rent and well worth it! The alarm is ringing early in the morning. Well, it’s actually still in the middle of the night, but the driver is already waiting outside. Tonight’s destination: Mount Batur. The active volcano is located on the Indonesian island Bali and it’s a popular spot to do some proper hiking. Most popular are sunrise hikes, which we are just about to do. After a short drive, we arrive at our starting point, the local guides are all prepped and hand over some torches. It is still super dark and the only thing we are seeing, are flickering torchlights of other motivated hikers and then the ascent begins. Gunung Batur, 1717 metres high. It takes two hours to get up to the top, maneuvering yourself along the improvised walkway you’ll notice locals are already busy heating up tea and coffee. Now it’s time to simply enjoy what is surrounding you: an endless view over Bali, with volcanic peaks, little mountains and wonderful temples. Stay where Clemens stayed and book a room at Casa Bidadari in Seminyak. The way down is actually the more enduring trail. It’s steep, slippery and full of small stones that create proper obstacles. However, the landscape around us rewards you for every step. After three hours and a couple of breaks, we made it and reached our starting point again – what an adventure! Padar in Komodo National Park is easily one of the best hikes in Asia. Located on a small island between Rinca and Komodo, the dusty climb to the top is around the 6-7 on the difficulty scale due to heat, lack of shade and loose soil/rocks that cover the trail. Altogether the hike only takes between 30 minutes to an hour depending on your fitness level (I made regular stops!) and it is highly recommended that you carry as much water as you can comfortably manage and ensure you have applied your sunscreen before you set off! The views from the top are straight out of Jurassic Park, and it is one of the most photographed viewpoints in the whole of Komodo National Park. To get here you will have to join a boat tour – of which there are plenty leaving from Labuan Bajo daily – where you will likely stay when visiting Komodo Don’t forget to see other great locations such as Pink Beach, a visit to the Komodo Dragons, and snorkeling at Manta Point! If you’re enjoying reading about the best treks in Asia please pin the image below on Pinterest or share it using the buttons at the bottom of the page. Campuhan Ridge Walk is an easy hike in Ubud that is great for all travellers at any fitness level. This short trek will give you breathtaking views of rice fields, valleys and the countryside on both sides of the pathway. Because the paths are well paved and the hills aren’t too steep, this hike is not too challenging. On a scale of 1-10, I’d rate it a 4-5, only because I was sweating and found myself feeling a bit tired during the hike. If you include stops for water breaks and photos, the hike should take about two hours to complete. However, there is an option to do the full loop, which is eight kilometers. The trailhead is very easy to locate; once you arrive at the Campuhan Ridge Walk, there’s a path with clear signs to follow. I stayed at the Four Seasons by Sheraton in Kuta before the hike and then at The Swaha Hotel in Sukawati Bali after the walk. Between the two, I’d recommend The Swaha Hotel because of its proximity to the hike – it’s only a 30-minute drive from the hotel. Let’s face it. If you’re flying all the way to Indonesia for a trek there’s a HIGH chance you’re going to spend at least a few days on this picturesque island. White Villa Hostel in in Ubud has room as low as $1/night and Alaya Resort sports a luxurious pool and more for $150 and up. Stay in Kuta before or after your flight for some surf lessons too! Seoraksan National Park is my favorite place in all of South Korea and the best hike is Dinosaur Ridge. This 16-hour trek is quite grueling and entails over 2000m of elevation change making it one of the most difficult treks I’ve ever done. Compound that with the fact that you have to complete it in a single day and my legs always hate me afterward. Don’t worry though these stunning views and crazy rock formations are well worth it. Along the ridge, you’ll notice a number of smaller peaks that locals say looks like the tail of a stegosaurus giving it the name Dinosaur Ridge. This hike is great from Spring through Fall but I wouldn’t risk these trails in the winter. Seoraksan itself is famous for fall colors but up here on the ridgeline, the leaves fall earlier and after venturing forth along these trails on three separate occasions I found Spring to be the best time for hiking Dinosaur Ridge. If you want to try this hike then I highly recommend joining a group tour that will bring you to the gates at 3 am when they open. Look for Seoul Hiking Group or BangawoYo Tours on Facebook to travel with the same guides that I loved hiking in Korea with! Bukhansan National Park has the profound title of World’s “Most Visited National Park” and although it can get crowded you’re certain to enjoy a beautiful view from the many mountains just outside of Seoul. One of the reasons that it’s the “most visited park in the world” is that you can get to any number of trailheads from the Seoul subway system! There are enough trails that you won’t have too much traffic but you’ll certainly pass families enjoying picnics throughout your trip to Bukhansan. Be sure to stop by one of the many Buddhist temples and if you’re lucky you’ll get to hear some beautiful prayers singing through the valley. Most hikes in Bukhansan are between 2-5 hours long with peaks like Baegundae or Dobongsan being only an hour or two from the entrance. If you’re up for a longer day in the mountains than Bukhansan is still great for you because you’ll find that many of the trails intertwine and you can enjoy as much or as little of a hike as you want. Saryangdo is one of the most rewarding hikes I’ve ever been on. A quick 30-minute ascent brings you to the top of this island ridgeline where you’ll enjoy breathtaking views for 6 hours. Most of the great hikes in Asia that you’re reading about here are long with a few good viewpoints but this hike is the opposite. You’ll have great views of islands scattered through the sea for your entire hike! The main peak on the island bears the same name as the mainland’s tallest peak, Jirisan, and stands at roughly 400m. You won’t get very high on this hike but that just means you’re legs will be happy and you can focus on the stunning view rather than the climb. Along the way, you’ll cross a gorgeous sky bridge and are sure to see local Koreans setting up for a picnic. If you say hello there’s a good chance they’ll offer you some kimchi and rice wine! Near the end of the hike, you’ll see the Jagged Ridge which can be a bit scary if you’re afraid of heights. Go slowly and focus on the stunning views on this spectacular hidden gem. One of the most exhilarating experiences of our travels was the time we explored Zhangjiajie Forest in China. You may have heard it as the Avatar Mountains due to the belief that the karst formations throughout the park were the inspiration behind the floating mountains in the movie. To be there and witness the raw nature of this place is beyond words. The 12,000 acre park is a beast to hike. Fortunately, you can pick and choose from the various locations based on your preference for what they offer, and getting from one section to another is easy using buses provided by the park.The convenient place to stay would be in the town of Wulingyuan. The easiest place to start the trail is at the Bailong Elevator, which takes you to the upper section. Reserve a room in Wulingyuan today and start planning your trip to the Avatar Mountains! You can expect to hike around 6 hours in this area where you can view all of the pillars from above. The other option is to hike next to the river where you can see everything from down below in the “valleys.” There are also some places where you can take cable cars across. Park admission is good for four days but if you can’t do all 4 days, which require at least 5 hours of hiking each, be sure to get on the trails for at least two! The paths are all well paved and very safe but I would rate the difficulty with an average of 7 out of 10 because there are areas with several (sometimes thousands!) of steps that may go up or down. If you are enjoying reading about the best trekking in Asia please share this post with a friend who loves hiking! One of our favorite hikes in Asia is the Tiger Leaping Gorge, located in South China in the Yunnan province, along the Jinsha River. The TLG is a straightforward hike, not too difficult. It can be done in one day, or you can choose to split it into two by staying overnight at one of the lodges there. It’s long though, so if you do it in one day it’s a 7 out of 10 as you have to maintain your pace to power through it. If you split it over 2 days, then it’s a 4 out of 10. The total hike is 26km/16miles long and takes around 8.5 hours. If you decide to split the hike into two days you’ll find the “Halfway Guesthouse” perfect for an overnight stay to complete the remainder the following morning. The trailhead is very easy to access – you reach it via a minivan from the nearest transport hub in the region, which is Lijiang town. Most will stay at guesthouses along the hike like “Halfway Guesthouse” and then “Tina’s Guesthouse” at the end. We chose another guesthouse we found on Tripadvisor, called “Tibet Guesthouse”, which we highly recommend because the rooms are cheaper, the family running it is really friendly, and you get a spectacular view from your window. The Great Wall of China had been on my bucket list ever since I learned what a bucket list was. It’s probably on yours too except you really don’t want to deal with all of those tourists that you see in every photo. Well, then I have the perfect hike for you! Head to Great Wall Fresh and stay with Mr. Chen just like I did. He drove me to an abandoned section of the great wall where I enjoyed a 6-hour hike alone with the Great Wall of China! At first, the trail was literally a crumbled tower and I climbed over rubble. Slowly but surely, the wall was restored almost as if each step took me through time. Before I knew it I was standing on a fully reconstructed Great Wall of China with no a soul in sight! Hiking the Great Wall of China was far and away the best thing I did while visiting China and I think you’ll love getting away from all the tourists on this wonder of the world so be sure to visit Great Wall Fresh. Are you brave enough to attempt Huashan’s Plank Road? The ultimate hiking thrill must be China’s Plank Road. Located on the sacred mountain of Huashan, the Plank Road is only 50 metres long, but it’s also only 45 centimetres wide! After attaching a safety harness you climb down the rough ladder of iron bars and steps cut into the mountainside. Before you hike the plank road be sure you buy travel insurance! I always use World Nomad to give me peace of mind in case something happens. Fill in your information below and get a quote instantly! At the bottom of the 20-metre ladder, you’re there. This is the Plank Road. Those 45-centimetre planks underfoot are how it gets its name. That’s all that’s between you and the valley bottom, some 2,000 metres straight down. You’ll squeeze past returning climbers on the same 45 centimetres wide plank and come out the same way you go in. Get your photo taken by the guy sitting in a small crevice, pick it up on your return. At the return point, there’s a small viewing area of solid rock before you turn around and head back out the way you came in. It will take you 3 hours of relentless uphill hiking to get to the start of the Plank Road – and that’s if you take the cable car up to that point. If you hike all the way back down to the base, then it’s around 4.5 hours to get there. Huashan hiking is typical of Chinese mountains. All the trails are concreted and stepped in a completely random fashion. The hiking isn’t difficult, although the steps are tedious and the crowds might be off-putting, the hardest part of the Plank Road is the mental strength you need to step off the edge of the cliff! Reserve a room in X’ianif you don’t want to stay locally or on the mountain, it’s just 120km by cheap local bus and a great place to visit from and return to. If you’re enjoying this post please pin the image below on Pinterest or share it using the buttons at the bottom of the page. Yubeng is a town in northern Yunnan at the base of Meili Xue Shan less than 10 km from the border with Tibet. Comprised of two isolated villages, it is accessible only on the backs of mules or on one’s own two feet. To reach the trailhead, trekkers must take a bus from Shangri-la to Feilaisi, then commission a car to Xidang. Luckily, guesthouses can help with arranging transportation. Allow 4 or 5 days for the trek: 1 day to hike in, 2 or 3 for day hikes from Yubeng, and another day to hike out. Once in Yubeng, book a hostel bed in the upper village (I recommend the YHA), and rest up for the next few days of hiking. There are three day hikes up to various points of interest in the Meili Xue Range: Ice Lake, Sacred Falls, and The Lake of God. Expect awe-inspiring views of glaciers, craggy mountains topping 6,000 meters, and prayer flags fluttering in the alpine air. Overall, the difficulty is about a 7 out of 10. Trails are well signed and maintained, and food and water are available in the village and on the approach from Xidang. Just be careful of the elevation! If you’re hiking around Asia then you are going to want travel insurance. It’s amazing how affordable it really is to give you peace of mind that if something were to happen you’d be covered. Fill in your info below for an instant quote! Hang Son Doong is the most exotic and amazing place that I’ve ever had the pleasure of hiking in. Hang Son Doong, meaning Mountain River Cave, is the world’s largest cave and situated deep in the jungles near Phong Nha, Vietnam. It’s hard to get onto one of Oxalis’ exclusive tours but the good news is that the neighboring caves and trails in Phong Nha-Ke Bang National Park are also beautiful! Inside Son Doong you’ll find 2 beautiful dolines where the roof collapsed sometime in ancient history. These skylights let the jungle grow inside the cave creating a unique landscape of cave features covered in everything from green mosses to massive trees. From time to time monkeys make their way down the cliffs of each hole in the ceiling known as a doline. The dolines are aptly named Watch Out for Dinosaurs & The Garden of Edam. Reserve a room at Ho Khanh’s Homestay in Phong Nha and start planning your jungle adventure! Sapa is famous throughout the world for its picturesque rice terraces and I had the good fortune of visiting during harvest season. I think harvest season is the best time to go since the rolling hills turn a shimmering gold as the locals work in the fields. Be sure to stay in a tribal homestay and hire one of the locals to show you around here in Sapa. The trails might be a little different from your typical hike since you’ll see plenty of houses but in spite of them you’ll still be surrounded in nature and I guarantee that this will be one of the best hiking experiences you’ve ever had. You can easily hike for just one day and still fall in love with SaPa but I recommend taking a few nights to really get into the village life. The trails aren’t too demanding but can be very confusing so I would take a guide with you and expect to spend at least a half day hiking. I recommend staying in Sapa City before and after your trek. If you have extra time you can take the cable car to the top of Fansipan Mountain! I had no idea that I could even trek with wild gibbons until I had already parked my motorcycle out front of Cat Tien National Park. The naturalist owner of our homestay said he knew where a few families of gibbons frequented and I immediately signed up for a hike with him. Forest Call Lodge has great bungalows and a wonderful guide near Cat Tien. Book your room today! The jungle walk was mostly flat and quite easy. At first the jungle seemed a little too quiet but then I started to notice a faint bird call and the buzzing of nearby bugs. Frogs and toads croaked while we walked past and then suddenly the branches above us shook with an unknown fury. A flash of orange swung from branch to branch as a female holding her baby lept to the next tree. Moments later two black blurs slowed to a halt and feasted on the berries high up in the trees. This family of gibbons left me awestruck. My ex-girlfriend wasn’t as amused by the gibbons and grew impatient with all the leeches she kept finding on her shoes so we eventually moved onwards. I LOVED the gibbon encounter and highly recommend it but if you’re like my ex you should keep reading to find your perfect hike. Nihn Bihn is famous for its karst mountains and is often referred to as “Ha Long Bay on Land.” These staggering mountains are full of sheer cliffs and draw many to their beauty every year. Most visitors to Nihn Bihn will stay in an area called Tam Coc where you can hire a private river boat to take you on an adventure in between these mountains. But the good news for hikers in Vietnam is there’s also a great hike above Mua Cave. The cave itself isn’t why you want to hike here but rather the temple at the top of the mountain. Follow the white zig-zagging staircase from one dragon to the next. Bring a picnic and hang out at the top or snap a quick photo and head out. You can easily spend a few hours here or just make it a quick stop on your tour through Vietnam. Mount Pulag in the Philippines is one of the highest mountains in the country with an elevation of 2,992 meters above sea level. Located in Kabayan, Benguet, Mt Pulag National Park is famed for its incredible Sea Of Clouds. When we finally got the chance to do the hike, we allotted a total of 2 days to witness the Sea of Clouds. It is best seen during sunrise, so an overnight stay is recommended. We hiked the Ambangeg/ Babadac Trail and would rate it a 4 or 5 out of 10. Admittedly, what made the hike challenging (at least for me) was the altitude as you go up. You can really feel how thin the air could be but the trails are well marked. The hike from the Ranger Station (where the trek officially starts) to the campsite (Camp 2) took about 4-5 hours. The following day, it took us another 2-3 hours of hiking to the summit, which started at 4AM. There are plenty of accommodations in Baguio City, where we stayed before and after the hike, and the city is very tourist-friendly. We were traveling as a group, so we stayed at a Pension House in Baguio City. It allowed us to cook our own food which made it very affordable. The Philippines is well known for its picture-perfect beaches with immaculate sands, but if you go further up north, a lush paradise awaits you with a unique slice of nature. Sagada is located in Mountain Province, a 12-hour bus ride away from the capital of Manila. Many tourists journey to this gem specifically for the outdoor activities such as spelunking, white water rafting, and hiking to mind-blowing rice terraces. One of the most popular trails here is the Sagada Eco Trail. Depending on your speed, it can take up to 3 hours to finish it. It’s a very beginner-friendly hike with some minor ascents and a couple of slippery slopes but, anyone in a healthy physical state can conquer it. The trail starts off at a church, leading you across the valley through high opulent trees. It takes you to a small waterfall and underground river. You can choose to continue the trail via the common route or if you’re feeling quite adventurous, you may follow the river inside the cave. I prefer the latter, but I would recommend a flashlight as it can get very dark. The main attraction of this hike is getting up close to the hanging coffins, perched high up in the valley. It’s a tradition that’s still being practiced today specifically in this province. It is believed that the closer the corpse is to heaven, the faster their journey to the afterlife would be. The process of hanging a coffin is a long one, and in the end, family and friends gather and pass the coffin from shoulder to shoulder until it is hanged. It is considered good luck if a liquid from the coffin drips on you! Penang park near George Town, Malaysia is a perfect mix of pristine white sand beaches and dense jungle with some wildlife to observe. Most people visit it as a day trip from Penang or George Town but it’s possible to stay here overnight and do a 2-day hike. The hiking trail is well maintained and marked with some up and down hills not very hectic. We’d give it 5 out of 10 difficulty level as the main challenge was heat and humidity. Hiking with a backpack in +35C and 100% humidity is not the same as being in temperate mountains. There are two designated campsites at Turtle beach and Monkey beach. At Turtle beach there is a turtle sanctuary where you can see rescued turtles. Be careful if you’re camping at Monkey beach, which totally deserves its name, because monkeys can be aggressive and go for any food. The water in the sea is warm nice for swimming or snorkelling. Be sure to bring mosquito repellent for after sunset when hundreds of them come out. It’s easy to get to the park from George Town it takes about 30 min by bus and they run all day with 30 min – 1 hour interval. We went to hike from George Town where we stayed at Roommates Hostel, an awesome place for Backpackers. Have you been on another great hike in Malaysia or anywhere else in Asia? Comment below so I can add it to the list! Southern Thai islands are wonderful in their own right but getting to see them from up above is even more amazing! Our favorite island is Koh Lipe, and if you head over to the nearby island Koh Adang and hike the Koh Lipe Viewpoint trail you’ll get the most epic view of the island ever. Take a 10-minute ferry from Koh Lipe to Koh Adang. Once on Koh Adang stop in at the rangers office and check out the map and ask them to point you in the direction of the starting point for the viewpoint hike. Finding the starting point can be difficult but once you’re at the top it’s totally worth it. The hike takes about 30-45 minutes to get to the top viewpoint if you find the start of the trail right away. I’d put it at about a 5 difficulty, especially if its been raining because it gets slippery. The trail isn’t well marked, but luckily a friendly stray dog basically lead us up there. It’s best to go in the morning before the heat really kicks in and be sure to bring enough water or buy some at the restaurant at the start of the trail. There is one restaurant on the island and it’s super affordable for drinks & food considering where it’s located. Most people stay over on Koh Lipe even though beach camping and a few chalets are available to rent through the rangers office. We always stay at Salisa Resort on Koh Lipe. Very few tourists make the trip over, it’s a great place to spend the day on the beach or snorkeling. Koh Phi Phi is known for its parties and picturesque beaches but did you know there is also an amazing viewpoint hike? The trail is well maintained and feels a bit more like a sidewalk than a hike but rest assured you’ll pass plenty of beautiful trees, birds, and maybe even a monkey or two. You can reach the top in about 30 minutes and turn around to see the picturesque island beaches that you came to Thailand for. This hike is perfect for anyone who’s a sucker for a view and is already planning on visiting Koh Phi Phi but shouldn’t keep you from exploring the rest of the island. Since its so short you’ll still have plenty of time to relax on the beach, take a longtail boat to Maya Bay or kayak to Monkey beach. Make sure you don’t party too hard at this hot spot because it would be a shame if your hangover kept you from getting to this viewpoint. If you’re visiting Thailand and enjoy hiking mountains, you need to find a way to do the Doi Inthanon Nature Trail. Doi Inthanon is a national park so be prepared to pay a nominal entrance fee. The good news is getting to the trailhead is pretty easy. You can drive or hire a minibus to get there (Mike recommends renting a motorbike to get around northern Thailand!). On road 1009, there is a parking place just a few hundred meters past the turn to the two Napamaytanidol Chedi (which you should also consider seeing). This trail is not difficult, probably a 3 or 4 out of 10. And you will need to hire a guide to go with you, which usually runs a couple of hundred Baht. Located near the top of Mt. Doi Inthanon, this trail stretches for 3km, snaking its way up the mountain until it gets to the ridge line. From there it follows the ridge a ways before turning back down into the forest. This hike would be a good half-day adventure. Between the climb and the beautiful flora you’ll see, you may want to take your time on this trail. Just be sure to go in the right time of year since it’s closed during the rainy season. Hiking was one of the main highlights of our recent trip to Kyrgyzstan, and the best hike we had was definitely the Turgen-Ak Suu hike. It only recently opened and takes three (or four) days to hike across the Tien Shan Mountains. The trailhead is not far from Karakol, about one and a half hours by Marshrutka. The reason why I said the hike is three or four days is that there’s literally nothing along the way in terms of infrastructure, so you can take as long as you like. We took three days to hike the Turgen-Ak Suu hike and it was quite hard because of the long hours we spent hiking every day and because of the tough terrain. Since it was only recently mapped, there’s not really a ‘path’ to speak of and no signs. You’ll either need to be exceptional with a map or hire a local guide but the upside is you’re surrounded by wild, pristine nature. You’ll find fields of edelweiss, sapphire mountain lakes and peaks capped with yet-unnamed glaciers. I honestly have never hiked in a place as unspoiled as Kyrgyzstan, where we didn’t see anyone for the duration of our hike! Hiking to the top of remote Lantau Peak in Hong Kong is an exhilarating experience. The first part of the hike takes you along a grassy ridge through the center of Lantau Island. Then a very short but steep ascent up an eroding cliff face takes you to the summit. At the top you are afforded a magnificent 360-degree view of the South China Sea and the rest of Lantau Island. One of the reasons I love this hike is that it is so remote. On a weekday it is possible to do the entire trek without seeing anyone else. On clear, windy days paragliders can be seen launching from the summit. Descend via a series of uneven stone steps to a Buddhist monastery where it is possible to enjoy a vegetarian lunch. At 934 meters, Lantau Peak is the second highest peak in Hong Kong. Located on Lantau Island, this peak can be reached by following the third stage of the greater Lantau Trail – a 70 km trail that forms a loop through Hong Kong’s largest island. To reach the top, take the subway (MTR) to Tung Chung Station and then Bus 3M to Pak Kung Au. This is the starting point of the 4.5 km, 3 hour, Lantau Trail Stage 3 which ascends Lantau Peak and then descends into the Ngong Ping plateau and the Po Lin Buddhist Monastery. This trail is considered one of the hardest in Hong Kong due to its steep ascent, numerous uneven stone steps, and exposure. I would give it a difficulty rating of 6 out of 10. Hong Kong is known for its breathtaking skyline, famous harbor and extremely high population on a tiny territory. Therefore, most people wouldn’t consider visiting Hong Kongto go hiking but there’s one hike you shouldn’t miss in Hong Kong – the Dragon’s Back! You can easily reach the trailhead from the city center. Take the metro to the station Shau Kei Wan and switch to the bus No. 9, which takes you directly to the start. The hike up the hill is quite easy and takes you around 1 hour, however, the boiling heat and the humidity make the hike challenging – don’t forget your water! From the top, you can keep walking on the “Dragon’s Back” with wonderful views on the bays of Hong Kong. There are several options to leave the national park, but if you stay on the trail, you will arrive at Big Wave Beach in a few hours. From here you can get some well-deserved beach time. Generally, the hike is fairly easy, I would say a 3 out of 10 and if you can stand the heat and humanity and can be done in half a day. However, you are better off taking a full day to include transport in and out of the city and some beach time in the end. If you stay in Hong Kong for some time, it’s great to escape the city for a day and the Dragon’s Back or Lantau hikes give you the perfect opportunity. If you’re just in town for a few days then check out these top hotels! Periyar Tiger Reserve offers a few different options for trekking but if you can get onto one of their overnight trips I HIGHLY recommend it. I went for 2 days and 1 night but they also offer a 2 night version that will give you even more of a chance to see the wildlife. The reserve is heavily controlled by park rangers to keep both you and the animals safe and they only have one campsite that tourists can visit so be sure to reserve your tickets as soon as you arrive in Kumily, India. Our trek started out with a single park ranger but we met a guard a little further in and started trekking deeper into the sanctuary. We passed herds of buffalo, boar, monkeys and deer while listening to all kinds of birds. Our route took us to a beautiful lake where we met another group of park rangers who maintained the campsite. We enjoyed a brief meal while watching herds come down to the lake for a drink before heading off on an adventure, tracking a herd of wild elephants! They had been seen earlier in the day and the park rangers knew exactly how to find them. We had to be careful in case a tiger or other animal showed up but the only signs of the big cat that we saw were some scratch marks on a tree and a few leftover kills. Walking through the jungle is an experience even if you aren’t in the heart of a bountiful wildlife reserve but Periyar is something else entirely. If you are in India and looking for an adventurous hike than make sure you add Periyar Tiger Reserve to your Indian itinerary. Vang Vieng is famously known amongst backpackers for its river tubing pub crawl, but, there are so many more reasons to put it on your bucket list. The beauty of this tiny mountain town parallels the more well known Phuket, Thailand and El Nido, Philippines with towering limestone karsts surrounding it. The most adventurous of visitors to this town stare in awe at these mountains and wonder how they can get to the top of them and Pha Hon Kham is one of the easiest ways to do just that, yet it is still a local secret. It is 10 km out of town so getting there is easy enough if you rent a scooter or bicycle. Go west out of the main town, across the river, towards the Blue Lagoon (one of the top attractions there). About 1 km from the lagoon, take a left at the fork in the road and signs will guide you to the viewpoint. There is a place to park your bikes for a small fee and you are on your way up. It is rather muddy in the rainy season and somewhat steep so good shoes are recommended. The hike takes 30 to 45 minutes to complete. Difficulty is 6 out of 10: steep and rocky, but relatively short. At the top is 360 degrees of breathtaking views. This 3-day hike is one of the most memorable things you can do in Myanmar. It starts at the former British hill station of Kalaw and it continues through the mountains of the Southern Shan State all the way to Inle Lake. To get to Kalaw I took the overnight bus from Bagan, but it arrived at 3am, a lot earlier than expected, and I decided to stay up at a 24 hour tea house until departure time at 8am. It was a long wait, so I recommend getting a place to stay even if it’s just for a few hours. The trek is reasonably easy, with the odd hill and plenty of views of mountains and valleys stretching across the landscape. But the best thing about this trek is the hill tribe villages it takes you through. Stopping to rest in the villages gives you the opportunity to interact with the locals and they may even invite you for a cup of tea. Overnight is normally spent in a homestay with a local family, and there is a monastery you can stay at on the second night. I did this trek in September and some sections of the path were very muddy, so I would recommend doing this trek outside of the rainy season. There are around 118 active volcanoes in Japan and the Kirishima range, with 15 active cones and 10 crater lakes, holds some of the most restless. The highest peak is Mt. Karakuni with Onami lake being the highest crater lake in Japan (1,412msl). The whole area is a hiking paradise all around, even though some tracks may be closed, because of the frequent eruptions. We reached the Kirishima area from Kagoshima, as one of the first destinations on our three-month bicycle trip in Japan. There’s a big tourist center up on the Ebino Plateau, where is possible to dine and sleep, buses to the Kirishima range tourist center depart from all the major towns. If you’re planning on hiking the Kirishima Range or any volcanoes be sure to get travel insurance just in case. Put your dates in below and you can see just how affordable it is with World Nomads! Although it is possible to make it to the Onami Lake and the Karakunidake crater following the same trail, we split the hike in two days, hiking the Karakuni peak from a different one. The trek takes around 40 minutes but you can easily stretch it out. It begins with a series of paved steps and quickly becomes rougher, but easily achievable by almost everybody. The lake is stunning with a view of Mt. Karakunidake behind it is simply majestic. In the morning we got to the Ebino Plateau, just 4 km from the Onami trailhead. The hike up to the Karakunidake (1,700msl), takes about 90 minutes. We first meet the Io caldera (Ioyama), with its smell of sulfur in a red and white landscape. The climb is harder than Onami’s one, but the views have an epic quality. Taroko Gorge National Park is one of the sparkling gems of Taiwan. It’s a place of great natural beauty with marble rock canyons, turquoise waters, and craggy cliffs. Most visitors come for day hikes and then head right back to the city. But if you really want to immerse yourself in Taiwan’s lush landscape, there’s a secret path combining three challenging trails that’ll take you straight up the mountain to a remote tribal village where you can spend the night immersing yourself in nature. Difficulty largely depends on weather conditions (rain and mud played a big factor for me), but it’s about a 6/7 out of 10. The first part is essentially all stairs with 1k feet of elevation gain in a few kilometers so prepare your legs for the burn! The next section is a few more kilometers of less developed cliff climbing and the third part splits: a shorter jaunt uphill for 2.9 km or a paved flat road for 6.4 km. All in all, about 7-10 km each way. There are five BnBs in the village that offer modest accommodation, a shared room of camp beds on the floor of a converted barn. Tribe members believe electricity is too convenient, so everything is either gas or solar charged. They get supplies only once a week so your meals will be basic and largely vegetarian due to lack of refrigeration. But the quiet of a simple off the grid is everything. You do need a permit to do this hike, so plan accordingly. Nestled in the wilds of the Cardamom Mountains in Cambodia, the remote community of Chi Phat was once a site of rampant illegal logging and poaching. In 2007, the Wildlife Alliance launched the Chi Phat community-based ecotourism project here, transforming former poachers into wildlife experts, and the hunting grounds into a site of epic hikes and adventures. Travellers stay in community run homestay or guesthouses, and can opt for bike, kayak, or hiking tours around the area. We opted for the 2-night 3-day hike, which took us from Chi Phat deep into the Cambodian jungle, where big cats, elephants, gibbons, and pangolin still roam. For three days, we trekked through the thick mountain jungle, cooled off in rivers and waterfalls, slept in hammocks under the stars, ate delicious meals made from forest vegetables, learnt local survival tricks – and even had a scarily close encounter with wild elephants! We’d class our trek as ‘moderate’ for someone with a reasonable fitness level (and doesn’t mind ‘roughing it’ in the outdoors), however, we did ours in searing heat of the summer which seriously upped the intensity. We advise planning your trip around the season. It’s also worth noting that Chi Phat is tricky to get to, about 4 hours from Phnom Penh, then either a 2-hour boat ride or 40 minute moto taxi ride to the village – but it’s absolutely worth it. One of the best hikes we’ve ever done! When going on a hike, I’m usually after an epic view. Yet when I trekked through the jungle of Mondulkiri, Cambodia with Elephant Valley Project, the outcome was quite different. What I got in the end was a magical experience of watching once captured and enslaved elephants learning how to become happy ellies again. The only human contact they get is directly with their assigned mahouts, so you are only allowed to watch them, as they naturally walk through the dense jungle of the “Wild East”. There are day hike and half day hike options as well as a volunteer option for a longer stay. I did the day hike in May, so it was immensely muggy. The path down into the jungle is guided by wooden steps, yet it is still quite slippery and steep. As you are traveling with a group of about 10 people, your pace is as fast as the slowest person, yet it will take you about an hour and a half from top to bottom. There is a resting area and an authentic Khmer buffet provided for lunch. After eating and a little nap you head out to follow the elephants to wherever they prefer to roam for about another hour or so before trekking back up to the van and riding back to the EVP headquarters in the main strip. I cannot be sure of the actual distance covered as there is a lot of stopping and starting as you move with the elephants, but the full day excursion was about 8 hours including resting. Difficulty is about a 4 because of the slipperiness and heat. I stayed at Mayura Hill Resort which is a little out of the way, but highly recommended as they have bikes available as well as a personalized driver for any excursion. It was also nice to be away from the main strip to completely relax in the much-needed infinity pool. I hope you liked this collaboration bringing you the best hikes of Asia! Although it is a huge list it was by no means exhaustive so if you’ve got another great hike in Asia comment below and I’ll add it to this list. Please share this post on Pinterest or your favorite social media platform below and thank you for reading. All photos and text were provided by each travel blogger. Don’t forget to follow www.LiveTravelTeach.com by adding your email at the top of this page to make sure you don’t miss any of these amazing adventures! Disclaimer: This is the internet and It is safe to assume that links and content contained on this webpage provide compensation to the website’s owner. The opinions represented here are those of the author and the information here is accurate as of January 2018. Is This the Best One Bag Travel Bag? OMG these photos are just breathtaking!! I want to do all of these! That first photo grabbed my attention. Love this collection!! I hope it helps you plan your next hike in Asia! I did Ijen and Bromo in Indonesia and you are so right to have them in that list. They both completely blew my mind, and especially so that I did them back to back with very little sleep. It was like some weird hallucinogenic trip! haha! Perhaps it was all the sulphur fumes? yeah Nepal really does have some of the best hikes in the world! Ijen and Bromo were two of my favorite hikes ever! I had a day or two more than you between them but those fumes were harsh as anything right? Wow what a list! As a keen trekker myself, I’ve been able to do a lot of these over the year as well. Everest Base Camp and Mt. Kinabalu are probably my two favorite. The latter doesn’t appear to be on your list – looks like a good #41. 🙂 Happy Travels. Dominic thank you for your comment. I think you’re absolutely right about adding Mt. Kinabalu. Please contact me at mike.j.still@gmail.com if you’re interested in adding it to the list! What a comprehensive list of hikes! However, I see only one from India and that too from deep south. I think there are so many hikes that you can do, specially in Himalayas and in Western Ghats that they should be included in this list. Hi Anuradha, I am sure there are many amazing hikes in India especially in the Himalayas and Western Ghats like you mentioned. Feel free to contact me at mike.j.still@gmail.com and I’ll happily add those hikes to the list. ok so this reads like a bucket list for me now! I trekked Annapurna a few years ago and fell in love with Nepal, I think it’s time to go back! Making this added so many new hikes to my own bucket list too! Its always a good time to go back to Nepal, so many great adventures there! As a hiker, I would love to check all these out. I thought Nepal was going to be in every position on this top 40 list. 😀 I have done the Dragons Back in Hong Kong and loved the views over the South China Sea. Such a peaceful and easy hike to do. Hey Mike, it looks like you’ve done an impressive number of hikes in Asia. Looking at your photos, it hit me how many parts of Asia actually look like Europe or Canada, especially those lovely lakes and snow-capped mountains. I’d love to check out the Cardamom Mountains in Cambodia. Hi Christina, I have done a lot of hiking but only about 15 from this list. The rest were submitted by other travel bloggers. It really is pretty cool how similar different landscapes can be even when they are separated by continents! The Annapurna Circuit is without a doubt on my list of bucketlist hikes, as is Everest Base Camp, though it was fabulous to read about other hiking possibilities in Nepal. Now that we’re based in Australia I’m hoping to be able to get to see a lot more of Asia, including many of these hikes. Mount Bromo is there on the list, as is Komodo National Park. I hadn’t heard of Dinosaur Ridge but those rock formations look crazy incredible! Cool list of hikes, thanks for the inspiration! Those two are well worthy of any bucketlist, I don’t think you can go wrong with picking ANY hike in Nepal haha. You should definitely jump over to Indonesia now that you’re living down under. Feel free to reach out if you need help planning your trip! I love everything about this list – it’s comprehensive AND gorgeous 🙂 Hiking is such an amazing way to get to know a new place (or one you already think you know), so I’m definitely keeping this for later! So many breathtaking pictures and experiences! I fell in love with mountains after my first visit to Nepal. As much as I love coming back to Nepal, I hope to get chance to experience a few other treks from your list!!! Hiking made easy Asia! And all of these hiking destinations are alluring. I’m not really a fan of hiking but I can ccompny my friend to some of these hike trails especially Dragon’s Back on Hong Kong. I love the views from there. I’m sire hikers will find this guide useful for it is detailed too. Thanks for taking the time to put this together. This list can’t be complete with some Himalayan treks in India (there are 100s of them). Kerela trek is a baby trek in comparison. Even Pakistan and Afghanistan also have some epic treks but I understand that not everybody would like to visit those countries. So many great hikes!! Not sure I could do the plank road though!! These are mighty treks… I haven’t done any. Makes me realize how less I have experienced the nature and its mountains. Very well made list and can inspire budding trekkers. Nepal is so high on our bucket list, what a dream trip it would be! The Annapurna Circuit would definitely be in our itinerary! Happy To see top 6 hike routes from Nepal. Try to experience more other routes of western hill of Nepal from where you can see breathtaking Landscapes. Nepal is the best for hiking and trekking! What other hikes would you recommend? try to experience Rara lake and khaptad of mid western hill of Nepal. Once if you hike for Rara i think you cannot let Rara without including in this list. I’ve never been to Asia, but I love to hike and you have given me so much inspiration! I think it would come as no surprise that honestly I would like to walk with rescue Elephants in Cambodia! Although every hike does seem beautiful in its own way!